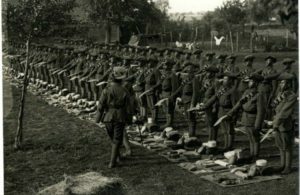 At the outbreak of the First World War the whole of the Nepalese Army was placed at the disposal of the British Crown. Over 16,000 Nepalese Troops were subsequently deployed on operations on the North West Frontier and as Garrison Battalions in India to replace troops of the British Indian Army who had gone to fight overseas. Some one hundred thousand Gurkhas enlisted in Regiments of The Gurkha Brigade. They fought and died in; France and Flanders, Mesopotamia, Persia, Egypt, Gallipoli, Palestine and Salonika. A battalion of the 8th Gurkhas greatly distinguished itself at Loos, fighting to the last, and in the words of the Indian Corps Commander, “found its Valhalla”. “I first met the 6th Gurkha Rifles in 1915 in Gallipoli. There I was so struck by their bearing in one of the most desperate battles in history that I resolved, should the opportunity come, to try to serve with them. Four years later it came, and I spent many of the happiest, and from a military point of view the most valuable, years of my life in the Regiment”.